Incarcerated veterans at the Albany County Jail will be offered an opportunity for a new lease on life through a collaboration between the jail and Soldier On, the multi-state agency that provides comprehensive services to homeless and at-risk veterans. Beginning this month, veterans willing to participate in the program will be separated into their own pod at the jail where they will be interviewed and assessed and then provided special counseling and other services with the intent of fully reintegrating them back into the community and reducing their rate of recidivism. Each veteran will be individually evaluated for their needs around substance abuse, physical and mental health, and behavioral history and then provided services specifically tailored to the veteran’s personal needs. 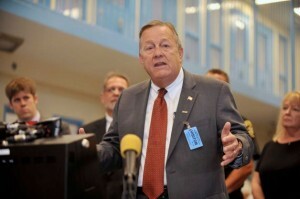 The program is a result of conversations initiated by Sheriff Craig Apple and Director of Services Theron Rockwell, both of whom had already embarked upon instituting systems within the jail to address the social concerns and needs of veteran inmates, according to Jack Downing, President and CEO of Soldier On. “After further meetings with jail staff and some of the veteran inmates, we knew we had the resources to run an excellent program,” Downing says. Soldier On had already been providing services to incarcerated veterans elsewhere through its Veterans Justice Partnership Program, in which services are coordinated among treatment providers, courts, probation officers and others to help establish alternatives to incarceration. Soldier On will bring a cadre of service providers to the jail, including four staff members with over 75 years’ experience in corrections. Dr. Kevin Cahill, mental health counselor. at Soldier On, and Soldier On Chaplain Quentin Chin will also have roles. The pod will consist of approximately 45 hours of programming each week with the intent of making an impact on veterans when they leave the institution. Soldier On’s extensive intake system is set up to comprehensively address the veteran’s needs, including registering him with the Veterans Administration and other services the veteran is entitled to upon release. Each veteran’s history of substance abuse, mental health, anger and personal reactions are evaluated to identify areas of treatment. Some twenty-three of the jail’s population of 43 veterans showed up for the program’s initial sign-up – a good core group to start the pod and begin to build a culture within the jail that will spread to other veterans and inmates, Downing said. The program will continue to operate in the pod for five days a week with some weekend activity to ensure operations are running smoothly and the correction officers in the pod are getting support. Costs for the program will initially be covered by Soldier On resources and staffing patterns, Downing says, with plans to seek grant funding on both the state and federal level to expand the program services without further internal cost to his agency. “We are tremendously grateful to Sheriff Apple for extending this opportunity to us on his own initiative by identifying the need within his jail and deciding after examining Soldier On’s past work that it was the right fit for this program,” Downing says. Soldier On currently operates veterans’ programs in five states. Its mission is to end homelessness among veterans by providing permanent, sustainable, safe, affordable housing with support services that veterans own and operate. Soldier On believes that within an environment of integrity, dignity and hope, veterans can regain physical and mental stability, housing and employment and economic stability, and become fully franchised and contributing members of their community. “The VA is pleased to be supportive of this new community relationship which recognizes the needs of veterans who are incarcerated,” said Linda Weiss, Director of the Albany Stratton VA Medical Center. “I’d like to commend Sherriff Craig Apple and Albany County for their dedication to the needs of all veterans. Their proactive approach and partnership has enhanced services such as Project Life Saver helping to keep veterans safe and now this initiative which helps those who are incarcerated, bringing them services they need and lessening the likelihood of becoming repeat offenders.